An enchanting design boutique on Indiranagar’s quiet 11th main, House of Three looks to marry India’s textile heritage with modern designs. Launched in 2009, House of Three, a design label, now has a swanky new address on Indirangar’s 11th Main. Sounak Sen Bharat and Anu Shyamasunder, the designer duo behind the label, are passionate about preserving India’s textile heritage, sustainability, and sleek designs. And it is this passion that they look to showcase in their collections. 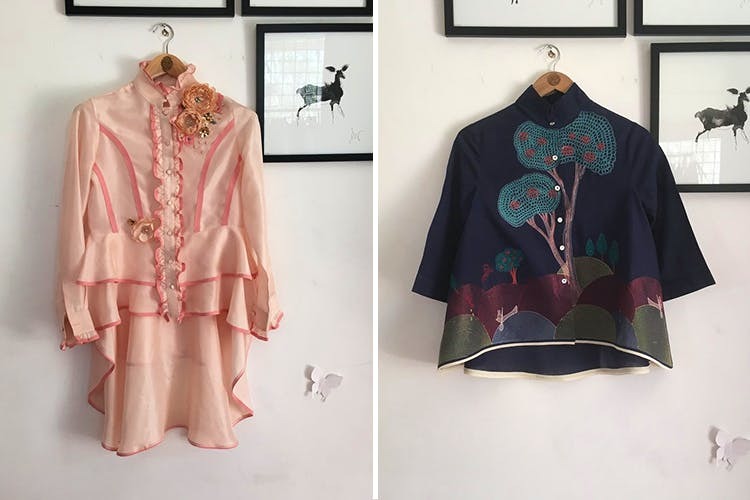 House of Three looks to represent “India in a new bottle” so they work along side award-winning weavers from corners of the land (from Bengal to Baneras and Tamil Nadu) to create their pieces. Their Couture and Pret line is all about marrying contrasts. So, you can see a chic, blush pink jacket crafted with Banarasi silk and embellished with Jamawar motifs. Then there is a Chantilly lace corset that flows out into an understated Kadhi linen skirt. Or a breezy Jamdhani top adorned with Japanese-influenced motifs. House of Three’s Couture line is especially for brides and grooms who are looking for something very different from the run-of-the-mill trousseau. Their Chanderis dotted with pearls and handcrafted suits will make you stand out on your big day. Prepare to shell out precious bucks for these exclusive designs. Their starter Diffusion line, crafted mostly with synthetics and is meant for the up and coming, starts at INR 2000 and goes up to 8000. If you are looking for a custom-made creation, appointments are a must.